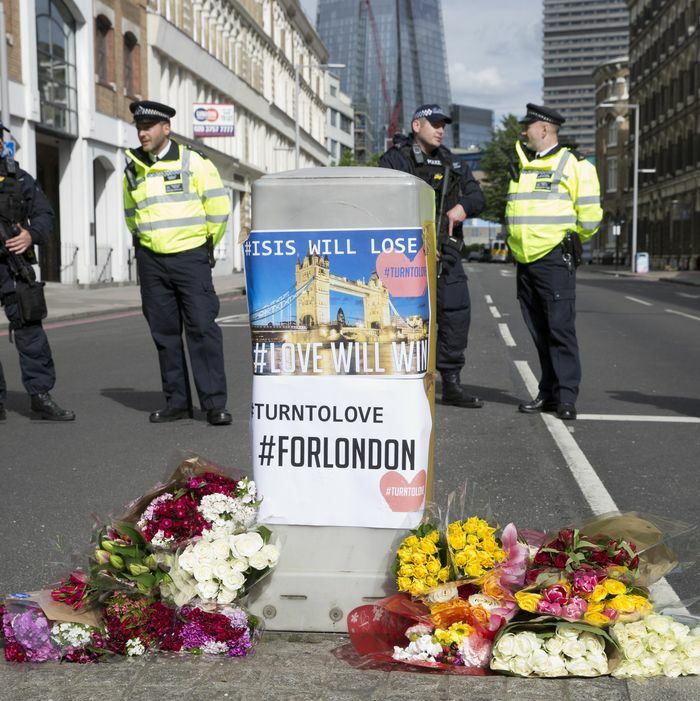 Police stand guard near floral tributes at the entrance of Southwark Street a day after the London terror attack. ISIS claimed in a statement from its Aamaq news agency on Sunday that “a detachment of Islamic State fighters” were responsible for the attack in London’s Borough Market a day earlier that left seven people dead and dozens wounded, including 21 who remain in critical condition. It’s unclear if the terror group had any direct role in planning the attack, as it claims anyone they inspire as a member. Over the weekend, ISIS sent a message on one of its main propaganda channels calling on supporters to “kill civilians of the Crusaders, run over them by vehicles” during the month of Ramadan. Police conducted raids in Barking, east London, early on Sunday morning and made 12 arrests, including seven women and five men, ages 19 to 60. One man was released without being charged. Police said they are still searching four properties believed to be connected to the attackers. Saturday’s incident was the third terrorist attack in the U.K. in three months. In March, a man drove a car into pedestrians on Westminster Bridge, killing four people, then fatally stabbed a police officer. Twenty-two people died last month in a suicide bombing at an Ariana Grande concert in Manchester. Grande held a concert on Sunday to benefit the We Love Manchester Emergency Fund, which was expanded to recognize the new victims in London. May said the three attacks were not coordinated, “but we believe we are experiencing a new trend in the threat we face as terrorism breeds terrorism.” She said there is “far too much tolerance for extremism in our country,” and called for a review of the nation’s counterterrorism programs. Britain’s general election will be held on Thursday as scheduled, and supporters of the opposition Labour Party accused May of politicizing the attack. May has accused their leader, Jeremy Corbyn, of being too soft on anti-Western militants.